What's on the Indiana Jones Bar Menu at Disney World? Back in June, an unconfirmed rumor claimed that Disney and LucasFilm are planning on releasing Indiana Jones 5 in 2018. Since the studio is so busy launching their revamped Star Wars franchise with Star Wars: The Force Awakens, it isn't known when they may have time to bring Indy back to the big screen. While we impatiently await any news on that prospective sequel, Indiana Jones fans can revisit this franchise in a brand new way, with an Indy-themed bar-restaurant dubbed Jock Lindsey's Hangar Bar opening tomorrow, September 22. The restaurant, named after Fred Sorenson's character Jock Lindsey from Raiders of the Lost Ark, was announced back in May, but today Disney World has unveiled the bar's menu, which contains plenty of references that Indiana Jones will enjoy. Here's the official description of the bar from the Disney World website. "If adventurous spirits have a name, it must be Jock Lindsey's Hangar Bar. This family-friendly, 150-seat waterfront lounge is best known for its delicious drinks and dishes and aviation-inspired décor-cleverly themed after the exploits of Indiana Jones and his seaplane pilot, Jock Lindsey. Buckle your seat belt and order a plate of Rolling Boulder Sliders (spiced meatballs on mini-buns with yogurt sauce) or a Brody Brats bratwurst, and then wash it down with a Cool-Headed Monkey with African spirits or a refreshing Reggie's Revenge. The small plates are great for sharing, like Dr. Elsa's She-Deviled Eggs (brined in beet juice with lump crab filling) or the Tanis Tacos, Snack of Ra-or "Good Dates." Beer, wine and the "spirits" of adventure live on in tasty cocktails like The Fountain of Youth, featuring Florida vodkas, The Bitter Barkeep with Peruvian Pisco or The Scottish Professor. Watch the sun set next to Jock's old steamboat (in dry-dock by the pier) while you sip a tasty Hovito Mojito-Barsol Quebranta Pisco with fresh lime juice and syrup. What's your pleasure, kid? Other menu items include "Squid! Why'd it have to be Squid?" (Fried Calamari Flatbread with Harissa Spread), Lao Che's Revenge (Spicy Asian Sticky Wings direct from Club Obi Wan), along with several signature beverages. One of these beverages, "Reggie's Revenge," is named after Jock Lindsey's (Fred Sorenson) pet snake Reggie from Raiders of the Lost Ark. Disney's Imagineers also came up with a thorough back story for how this pilot ended up in Disney Springs. "How did Indiana Jones' barnstorming pilot Jock Lindsey end up in Disney Springs? Fans of Raiders of the Lost Ark can't forget Indy's easygoing pilot Jock Lindsey-owner of a pet snake named Reggie-but how did Jock arrive here? The two globetrotters stumbled on Disney Springs in 1938 while chasing down a mythology-based tip in central Florida. Attracted to the town's natural springs and lush terrain, Jock bought some waterfront property and eventually settled down, piloting seaplane tours across the fast-growing Sunshine State. Jock eventually built an airplane hangar, air tower and runway, and invited fellow members of The Society of Explorers and Adventurers to pay him a visit. His home base soon became a popular stopover and watering hole for world travelers and locals alike. Jock Lindsey's Hangar Bar was born! Today, thrill-seeking families cross borders and continents to soak up the rugged charm of this artifact-strewn hangar bar, with its spare airplane parts, salvaged equipment and dusty mementos of glory days gone by." You can visit https://disneyworld.disney.go.com/dining/downtown-disney/jock-lindseys-hangar-bar/menus/|DisneyWorld.Disney.go.com to check out the full menu for Jock Lindsey's Hangar Bar, before the bar-restaurant opens on Tuesday, September 22. Do you plan on visiting Jock Lindsey's Hangar Bar sometime in the near future? 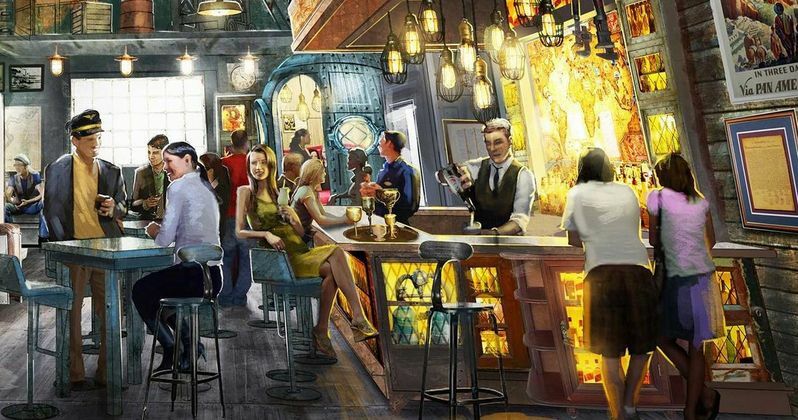 We'll keep you posted with more details on Indiana Jones 5 as soon as we have more information, but in the meantime, check out the concept art illustrations for Jock Lindsey's Hangar Bar, which debuted back in May.